You know....when you get some delicious idea in your system and you can't get it out until you do it or get it? That happened to me........as it often does to my great delight.....it keeps reminding me how wonderful it is to be a deeply feeling woman.........and so it happened again. In my blog, I write to my Soul, to my Self. And to my dear friend Pammie who I can no longer visit and rarely speak to, who reads this for her pleasure and I speak to her too. It is like a journal I keep for me. It reminds me of things I don't want to forget. Therefore I write with details, and stories, and descriptions, and sensations. It reminds me of those things I want to remember. Some are only interested in decor and pictures, you can simply skip and look at images, however you lose the experience and the richness of the scents........or.......scentsations.....for those not interested in lyrical prose or storytelling, its up to you :D.
I could not get images out of my head......images that came with feelings......because they were created with so much......the images/feelings were a like a flower vision but complete with fragrance. Some of the images were from Simply Me blog which is a complete visual garden of paradise for me, some images from Rachel Ashwell, some from Bella Notte , some from Arte Pura, or Les Ours d' Uzes , my own life and experiences and travels, and many other sources.....I am a very sensorial person, very sensual. In this case I have been awakened to all the possibilities in bedding, its textures, colors, temperature, feel, how it nurtures, everything. Turns out, my "simple" was too simple. 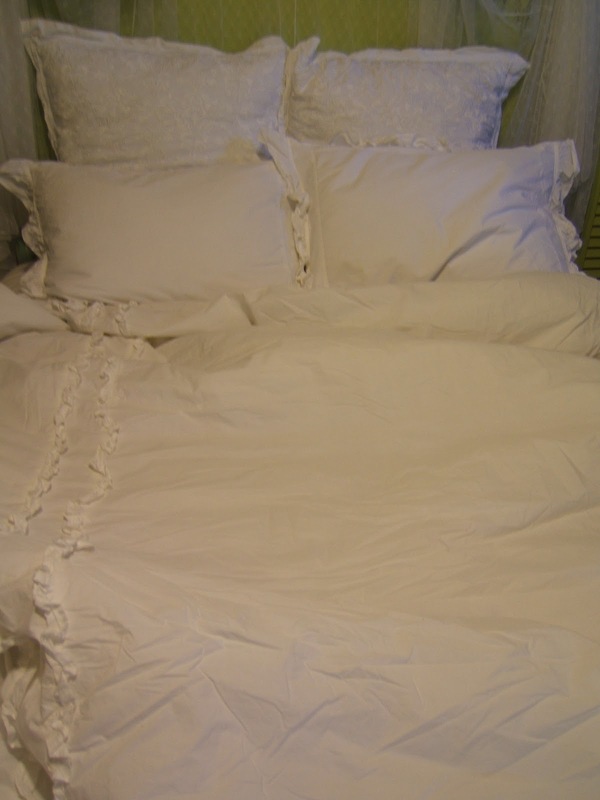 I had a good down summer comforter which has to be light because I live in south Florida. As it happens in life, the unexpected happens, like wandering into a garden after meandering for too long in simple woods, I came upon a familiar glade, that was still so rich in its effects upon me, and one that touched my soul in ways I've forgotten, to my great sadness, yet so happy to feel this depth of beauty in my soul again. I found again, the garden of softness, the feminine spirit of pastels, soft organic fabrics, flowers, simplicity, and that ever so whimsical touch......ruffles ! LOL I discovered the joys of dressing up the home. I've been good with dressing myself and embellishing me with ruffles, but the home!....... Yes, I'm just catching on! I never indulged in ruffles before though I loved them, don't know what happened there. But now it came to my consciousness that I adore them, short stiff whimsical ruffles as in edging to pillows, or long silky ones as found in dresses and skirts, the kind that flow, their movement like the most enchanting dancing partner who embellishes every move I make, and makes me look even better :D:D:D.
I began to save and record images I loved, to see them all together and I found some common themes, basically, in a word, already described, named, and marketed under the title Shabby Chic. I had been there before, but left it. Now I find I did not really leave it, only left the commercialism of it, but it remained within.....how could it not when it was only expressing and describing the woman's natural soul? In fact, it is not just a name of a look, it is an entire lifestyle as far as I'm concerned. I could go on about this but I will simply say, that this style of feminine grace in softness and simplicity and femininity is carried into ones choices in all things, from the way one decorates obviously, to the way one lives in the details of the daily "chores" which in my opinion can be made into moving meditations when one uses things of great beauty in utensils and everything one touches is a work of art and loved. The Japanese excel at this and is why I love their dinnerware......and these choices extend all the way to how one dresses, and what kind of products you use on your body and in the home. For me there is only organic. This organic lifestyle began my journey into my own Feminine Spirit of the softness and beauty that woman is. To see it expressed, painted if you will, on the canvas that is my life is nothing less than a beautific joy......that is, when I do it consistently and religiously to authentic choices made from my authentic self with no short cuts or compromising on quality and beauty. 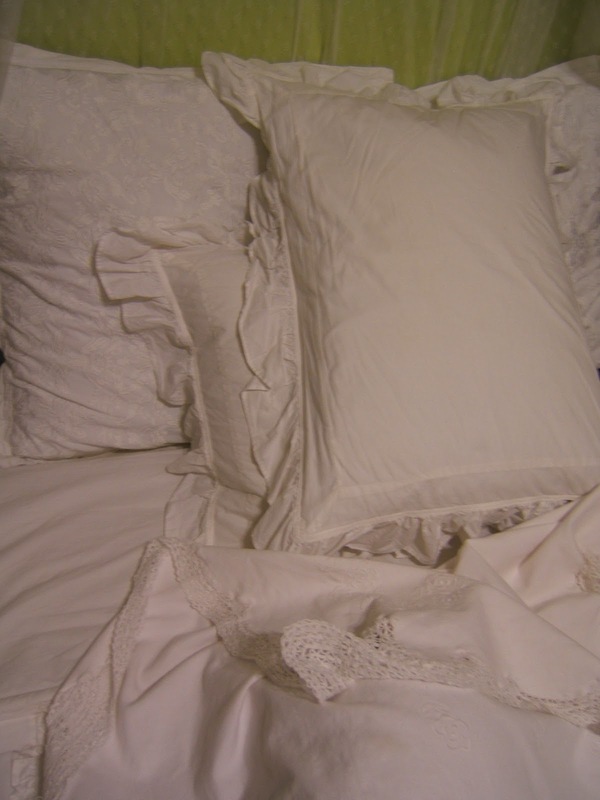 I have done ok and even very well in some areas, but one area that remained vacant of these authentic uncompromising choices is in my bedding. And I realize now I did "shortcuts" in my bedding which is where I spend a third of my life. I had one down comforter and white pillow cases on some random deco pillows and this was my bed. 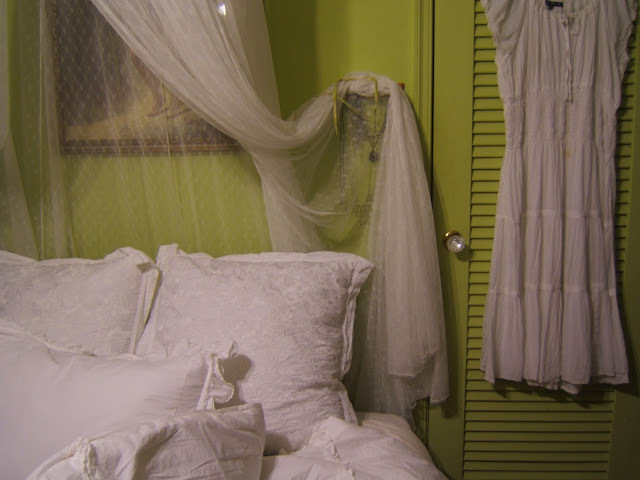 It was sufficient, simple as one can get, clean and crisp but I realized it lacked lushness, richness, whimsy and embellishment save for my mosquito net.......until now. as that is really when I could sense something was missing from my simple bedding, and there IS a difference between "simple" and "lacking". I could not indulge $ in what I wanted so I had to go hunting for all the alternatives.....other companies, making it myself, thrifting (NOT), and searching on and on. When it got to the point where I'd get into my own bed every night and found it wanting, I knew I had to do something. Now understand, I'd not wanted to give the material world so much importance nor to let it take over my mind and thoughts because for me the spiritual world and my relationship with Nature is priority, so it takes a while for the material world to take over most of my thoughts as in wanting and desires. I steer away from them preferring Spirit. I only bring home what is beautiful, and "decorating" is done. But something wasn't right. I couldn't figure out at first why I even had desires because I felt my bedding was sufficient. However, the Soul doesn't speak in language, it speaks through the senses, and I wasn't listening well enough. It was coming through as a "discontent" but I wasn't hearing it properly. My home is beautiful, all of them have been and I've even had one woman cry when she entered my duplex townhouse on the water. However, some areas needed a bit more attention, and one is my bed, which I have now thankfully realized. Of all the alternatives, I decided sewing miles of ruffles was not something I wanted to do as I've discovered I don't like making them, and in my clothing it is difficult enough. 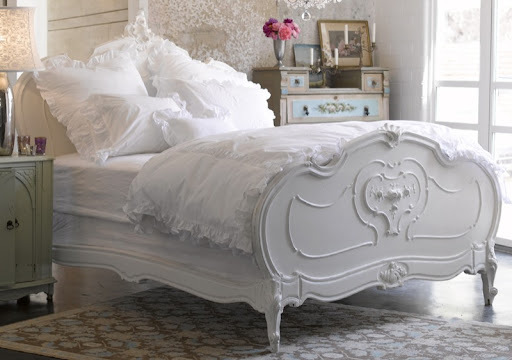 So after many many pictures, and many hours perusing online, I finally decided upon Simply Shabby Chic line at Target as I've read from many who have Rachel Ashwell bedding and all love it, I have not read any complaints and all the pictures people post are too beautiful. When my car insurance money came in, it was 9PM, my bedtime, but tickling sensations were now swimming and wiggling around in my body making me giggly and giddy....."what if..."......what if I took that money and INDULGED ???! I have a simple way of making decisions lately in my wiser twilight years......if my body dances, it means go, green light, do it, don't wait, move now, YES ! I checked the hours for Target....they close at 11PM. I had plenty of time, shopping would be a quietly giggly pleasure. I dressed and stole away into the night driving with an impish grin, and with huge lightening flashes lighting up the entire skies. 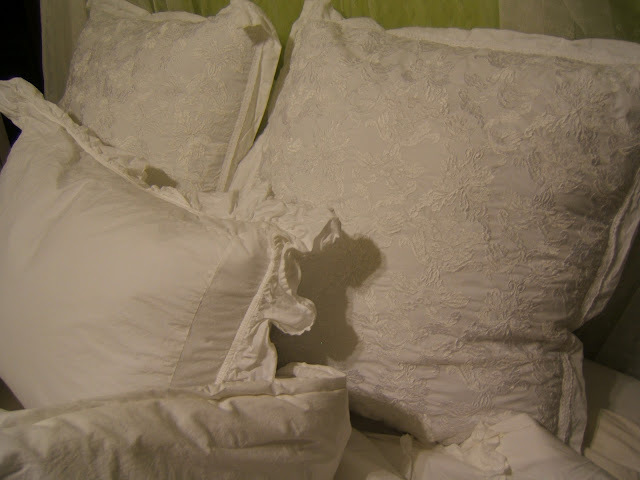 I got to my "target" LOL, meandered to the bedding section, browsed, wondered, and finally picked up the White Heirloom set with one Euro pillow and two feather pillows for the shams. This Target had only one Euro pillow and I needed two and I knew the other Target had one so I had to go there, and I did, driving with lots of lightening in dark streets feeling like a pleasure thief on a secret mission LOL. When I got home I left the items in the car for the next day and only brought in one large embroidered Euro pillow because I simply could not leave all that lushness in the car and not have some to sleep with that very night. 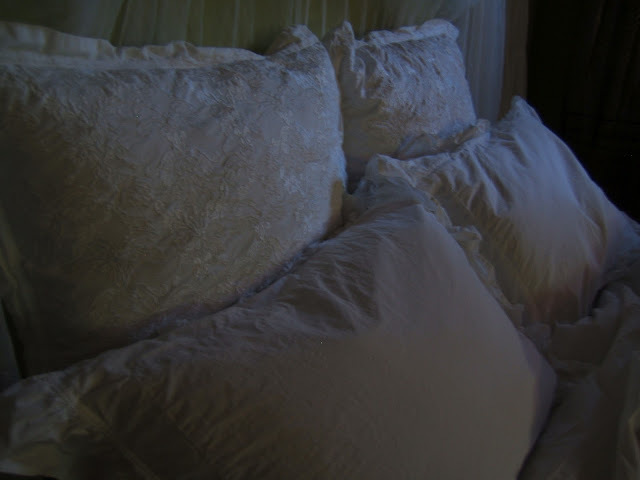 I propped the large pillow up, lied upon it, and felt dreamy, supported, cared for, a nurturing quality now in my bed, holding me up softly as I let go of mind to sleep. Oh how I have been missing this. Yesterday was a day for laundering them, drying them, and doing my bed in luxury, giving it the much needed richness, lushness and whimsy it was lacking. It was fun, even thrilling to find these qualities in an area that has never had them before! Things got busy but I did launder them, and I stayed in while it thundered with torrential rains, but I was cozy with my neighbor while we dined liked queens and watched movies lounging. It was late and I was entirely exhausted when I had finally made up the bed and got into it myself freshly showered and fragrant with softly scented rose and geranium Artisan soap by Hugo Naturals . Highly recommended Lushness! I just bought their lavender.....I cannot believe how transformative those scents are when I soap up and lather my body.....everything fades away in the fragrant clouds of those amazing soaps. I have now slept in it overnight. I thought the comforter would be too heavy and I'd be too hot. It was not. I thought it would be too stiff, since it was stuffed with polyester which I abhor and not feathers, and while it is stiffer than my down comforter, it is not too stiff, only enough to hold itself up in interesting peaks alot like whipped cream peaks which are great for allowing the cool air to flow underneath. This was a great discovery! I have to say I love it which is why I'm in such a lyrical mood and intend to remain so all day, indulging even further in my souls quest for authenticity and needs and comforts by gracing my environment with the proper embellishments she needs. I now want the Rachel Ashwell Linen Garden duvet set which my Target has, and the pink Misty Rose duvet set, which is not too pink because the background is white and the roses pink. I love these palettes and I will now have luxury on my bed which is the sanctuary of sanctuaries in my life. I have read that every second Thursday Target has clearance on their bedding items, and since last week there were none, I'm hoping this week there will be, and if such is the case, I will be picking up another set. Here are my own pictures taken on a cloudy sunless morning. This first one I left dark because the embroidery on the Euro pillow can be seen better. Its gorgeous. This green is not the true green of my walls, lol, it is more mute, but here it looks like something else. eyeroll. Treat yourselves to comfort and beauty always, in all ways. Update: I have now slept in these for 2 nights, and they ARE the most comfortable nights I've had in many years, I think because it is actually cooler! than my feathered comforter! I don't have to repeatedly keep turning the AC on and off all night which I have to do every single night. Temps were fine...a major thing for me....sigh ....wish I had known sooner. 2nd Update: It has been a couple of weeks and I've definitely slept much better than in many years. The pillows are what makes the difference, because I don't have a headboard. Both the Euros against the wall supporting the 2 feather ones which I prop up one over the other so I basically lean back slanted up yet I drift off to sleep in no time. The first sensation I have when leaning back onto the feather pillow I feel the sinking into it.....divine.....then I'm nestled in when the sinking stops, and the nested feeling is what makes me feel, well.....nested, like a bird in her own feathers, in her own nest. I'm planning on getting the Euros for my sofa now so I don't have to bring them from the bed to the sofa which is what I do when I finish gardening etc and sit to watch a dvd like Mary Poppins....its a good life! Oh I so want to junp in that bed and take a little nap. I enjoy reading your blog so much. Thinking I may need to check out target and change my bedding, I have a white comforter, but oh how I love those Euro pillows. Have a great day! This bedding with the Euro pillows especially invites that "jump in now" feeling with many! LOL I'm glad I did it. You have a great day and week too! Oh I am so glad you like it. I feel the same way...it is dreamy comfort. It is already too hot here to keep mine on my bed. I have it folded up on my R.A Shabby Chic pile next to my dresser so I can still see it along with the floral ones I've collected over the years. I have been aweing over the misty rose duvet set too. Enjoy your undulgence. I do like it Kerrie, though it is only one night, it still is enough for me to know. I can't wait now to get the "Linen Garden"....I love linen so much. Your bedding looks lovely! 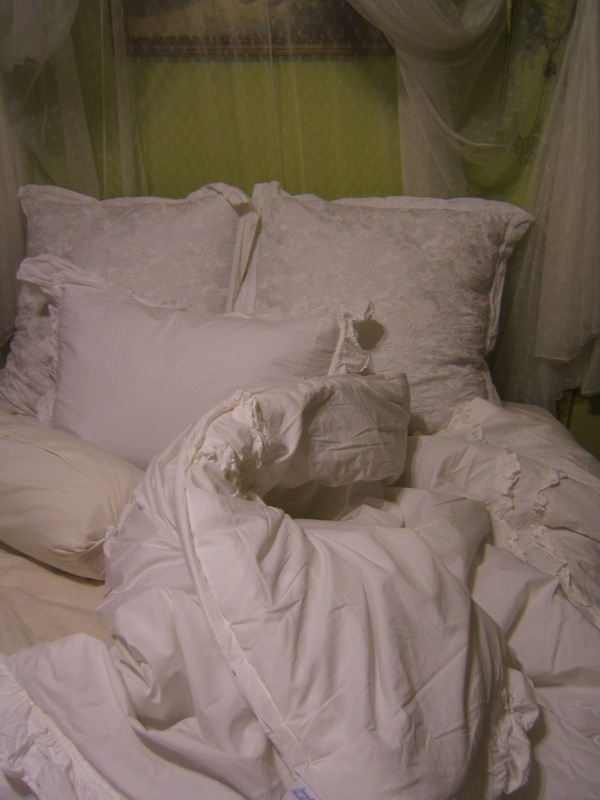 I have always loved having white ruffly bedding. 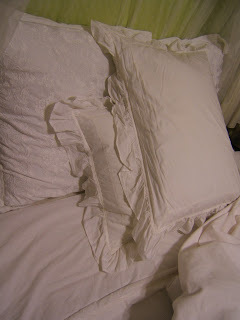 The Simply Me blog inspires me to not me so perfect with my bedding as hers is just everywhere and looks so lovely! Sweet words, and isn't it wonderful when we honor our true hearts desire? Thank you for all of your thoughts expressed lovely lady, and sweet dreams come from a little lavender spritzed on your bedding! Your right the words & pictures have to go together...the effect is lost otherwise...Wonderful story with a fairy tale ending...I have some antique bed linens that are calling me...this is too inspiring...we need to pamper ourselves like this....& there I nothing like a wonderful bed to sink in...Thanks for such a beautiful read...and photos as well!! I have now slept in these for 2 nights, and they ARE the most comfortable nights I've had in many years, I think because it is actually cooler! than my feathered comforter! I don't have to repeatedly keep turning the AC on and off all night which I have to do every single night. Temps were fine...a major thing for me....sigh ....wish I had known sooner.